Ultra Preventive X tablets may be a useful dietary supplement for those who wish to consume the essential nutrients for health. Ultra Preventive X has been carefully developed to contain the right proportions of vitamins, minerals, trace elements, and other nutrients without danger of toxic build-up or other side effects. 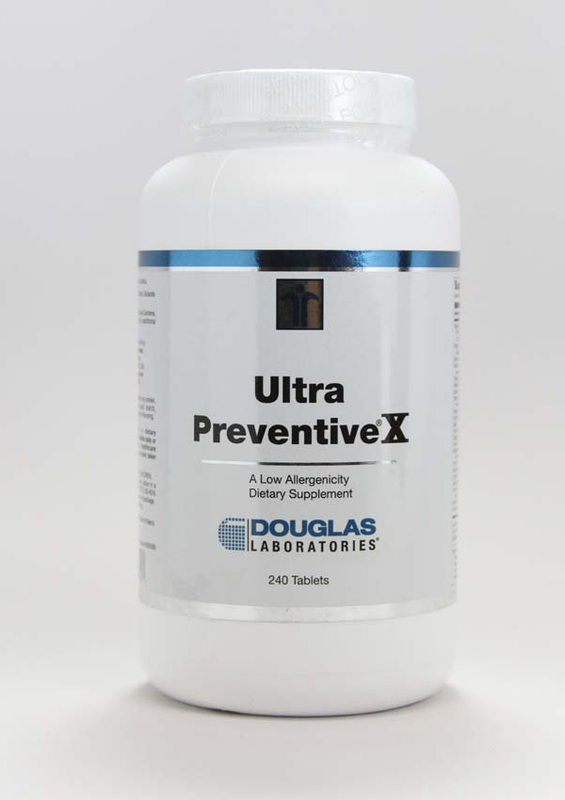 Douglas Laboratories is proud to announce that Ultra Preventive X now contains Metafolin, a patented, natural form of (6S) 5-methyltetrahydrofolate (5-MTHF) as well as 1,000 IU of vitamin D3 per serving. 5-MTHF is the naturally occurring, predominant form of folate commonly found in cells and is essential for overall health, as it participates as a cofactor in a reaction that involves the remethylation of homocysteine to methionine. Unlike synthetic folic acid, 5-MTHF can be used directly by the body, without the need for an additional conversion via the enzyme (5,10-methylenetetrahydrofolate reductase (MTHFR)). In certain populations, the body's ability to convert folic acid to 5-MTHF by use of this enzyme may be compromised due to genetic differences. Metafolin contains only the S isomer of 5-MTHF and has been shown to be the only form of folate to be able to cross the blood-brain barrier. Additional vitamin D3 (also known as cholecalciferol) has been added to this formula as numerous scientists now feel that supplementation with vitamin D at levels greater than previously thought necessary is critical to helping maintain overall health. Studies show that a high percentage of adults in North America and other developed areas eat less than the minimum daily allowance of 10 or more essential nutrients. Adequate amounts and proper balance of these nutrients are needed not only for maintaining good health, but also for the dietary management of the body's structure as well as the optimum functioning of its various systems, including the immune and gastrointestinal systems. Ultra Preventive X has been carefully developed to contain the right proportions of vitamins, minerals, trace elements, and other nutrients without danger of toxic build-up or other side effects. Each ingredient is selected in consideration of its absorbability, competitive relationship with other nutrients, allergenic potential, and long-term safety. Certain nutrients such as beta-carotene, vitamin C, vitamin E, and B-complex vitamins are included in high-potency amounts because of the vital roles they play in antioxidant protection, energy production, the maintenance of healthy blood cells, the nervous system, hormonal balance, and more. Minerals and trace elements are provided in their safest and most bioavailable forms. Ultra Preventive X's herbal green food base also includes important phytonutrients. Gluten-free grasses and several varieties of microalgae supply chlorophyll, carotenes, B-vitamins, and trace elements. Cruciferous vegetables, broccoli and cauliflower, offer protective sulforophane compounds known for their ability to induce protective phase 2 detoxifying enzymes. Adults take 4 tablets daily or as directed by a healthcare professional. This product is best taken with meals in divided doses, such as 2 tablets with 2 largest meals of the day. Iodine (from kelp) 200 mcg. Bromelain (2,000 GDU/g) 50 mg.
Organic blueberry powder, Organic broccoli powder, Organic Concord grape powder, Organic green cabbage powder, Organic Collard greens powder, Organic mountain cranberry powder, Organic kale powder, Organic Parsley powder, Organic pomegranate powder, Organic raspberry powder, Organic spinach Powder. Cauliflower (entire plant) 100 mg.
Chlorella (broken cell wall) 100 mg.
Celery powder (leaf) 70 mg.
Black radish powder (root) 70 mg.
Apricot powder (fruit) 70 mg.
Green Tea Extract (leaf) 50 mg.
Apple Pectin (fruit) 50 mg.
NOTE-this product is Magnesium Stearate FREE!